For Tomac fans, this was tough to watch. And ever since his shoulder injury at the Thunder Valley MX in 2015, we’ve been waiting patiently for a comeback. This race led into a conversation I had this morning with UC Berkeley alumnus and lactate metabolism expert, Dr. Jack Azevedo of California State University Chico. We speak regularly about many things, motocross training being one of them. To give credit where credit is due, I became really interested in motocross because of him. Racing is part of his lineage, plus, he uses motocross training as a teaching point within his lectures on fuel metabolism and muscle physiology. Did they get it right? Well, partially. Bottom-line: I am somewhat disappointed. 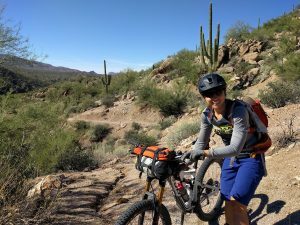 I would have thought John Tomac to have a better understanding of exercise physiology and training, considering his professional accolades in mountain biking. “Professional athlete” does not translate to “physiology expert.” And this is OK. This statement is in no way attempting to discredit the Tomacs’ (or any professional athlete’s) knowledge of bicycle and motorcycle racing. Clearly they are doing something right – very right. However, the science presented in these video MUST be corrected. FACT: Muscles will not “lock up” when lactate is produced, as John states in the video. “Lactate efflux from muscles is related to exercise intensity, NOT anaerobiosis,” states Azevedo. Studies show a clear dissociation between blood lactate accumulation and intracelluar partial pressure of oxygen (PO2). 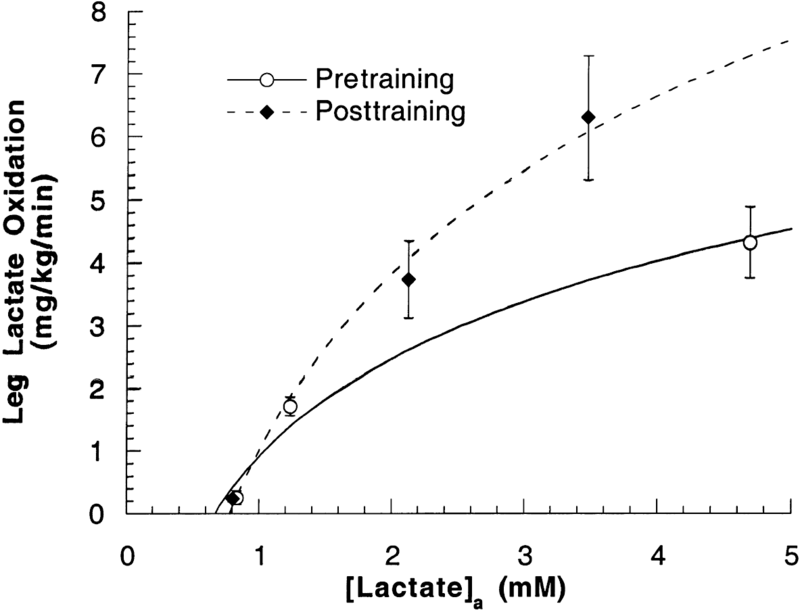 In the figure below, you can see as PO2 drops, lactate efflux from muscle tissue does not change. 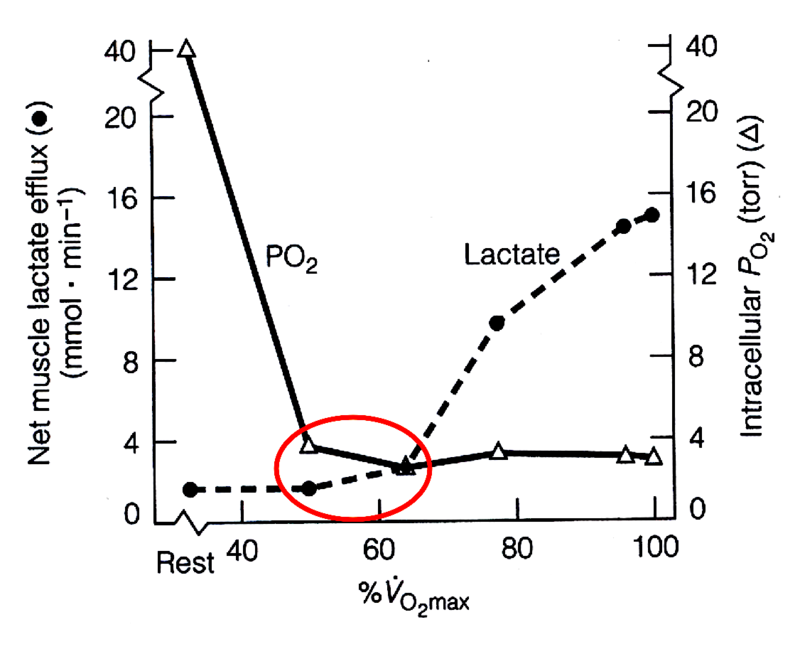 Only when VO2 reaches ~65% of maximum does lactate release into the blood begin to increase, however, PO2 remains constant. Richardson et al. JAP 85: 627-634; 1998. When glycogen (the stored form of glucose) is broken down, it is done so without the need for oxygen. Furthermore, when glycogen is the initial source of carbohydrate during high-intensity exercise, lactate is the final product. It can enter the bloodstream and be “shuttled” to and be taken up where it is needed – working skeletal muscle, the heart and the brain. It serves as a fuel source. In fact, when blood lactate levels increase, it is preferred over glucose and fatty acids. A study completed in 2002 by Dr. Benjamin Miller of the University of California, Berkeley, concluded the following: when lactate is infused into the blood in high concentrations, it was found that working muscles take up lactate preferentially to glucose. To further support these results, check out this study on carbohydrate sports drinks and performance, conducted by Azevedo and his team at CSU Chico. They found significant increases in performance when a drink containing a lactate-polymer is used vs. a drink without lactate. More than 90% of lactate is oxidized as fuel. In addition, as metabolic rate increases, so does the rate of lactate oxidation, according to research conducted by Dr. Robert Mazzeo, University of Colorado, Boulder, in 1986! Furthermore, the liver is able to convert lactate into glucose. During recovery, lactate is used to replenish depleted glycogen stores (this is called the Cori Cycle). Lactate escorts hydrogen ions out of working muscle tissue. Accumulation of hydrogen ions will impair performance and is also responsible for that notable, misidentified, acute burn in working muscle tissue. FACT: Training will increase the amount of glycogen that can be stored in skeletal muscle and the liver. In return, more lactate is released during exercise, and and more can be oxidized used in the ways mentioned above. Furthermore, the rate at which is lactate is oxidized also increases, so blood levels of lactate will decrease more quickly. FACT: Mountain biking worked for John… because he was a mountain biker. This is NOT stating that development of endurance and power through cycling isn’t vital to obtaining the necessary fitness to perform on a motorcycle. This is stating that incorporating 3,000 ft climbs into a regular training plan will make Eli a great climber – a fit cyclist. Specificity of training is key. If you want to run well, you need to run. If you want to ride well, you need to ride. A good motocross training plan has many variables within it, but clarification of these principles are still important. FACT: Arm pump is not caused by “lactic acid” build up – this is erroneously shown by the episode discussing the syndrome. As explained earlier, lactate metabolism is still haunted by its misunderstood past. Discard the term “lactic acid” if it is something you are still hanging on to. Now, what type of explanation are you left with? If the forearm musculature is not conditioned to sustain the physiological demands placed on it during performance, it will ultimately suffer. Sustained isometric contraction of the forearm muscles not only leads to fatigue, but it also prevents blood flow in and out of the forearm compartment. 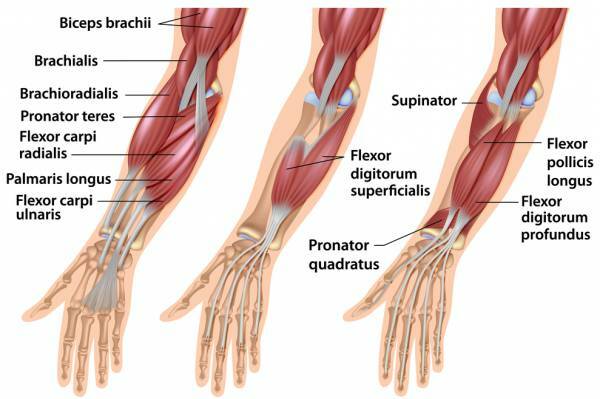 Anatomy of the forearm musculature. Ultimately, science is for the experts. Coaches need to be educated by the scientists. Athletes need to perform, educated by coaches with an updated and accurate foundation of physiological functionality. It’s a win for everyone. Azevedo Jr, J. L., Tietz, E., Two-Feathers, T., Paull, J., & Chapman, K. (2007). Lactate, fructose and glucose oxidation profiles in sports drinks and the effect on exercise performance. PLoS One, 2(9), e927. Bergman, B. C., Wolfel, E. E., Butterfield, G. E., Lopaschuk, G. D., Casazza, G. A., Horning, M. A., & Brooks, G. A. (1999). Active muscle and whole body lactate kinetics after endurance training in men. Journal of applied physiology, 87(5), 1684-1696. Mazzeo, R. S., Brooks, G. A., Schoeller, D. A., & Budinger, T. F. (1986). Disposal of blood [1-13C] lactate in humans during rest and exercise. Journal of Applied Physiology, 60(1), 232-241. Miller, B. F., Fattor, J. A., Jacobs, K. A., Horning, M. A., Navazio, F., Lindinger, M. I., & Brooks, G. A. (2002). Lactate and glucose interactions during rest and exercise in men: effect of exogenous lactate infusion. The Journal of physiology, 544(3), 963-975. Richardson, R. S., Noyszewski, E. A., Leigh, J. S., & Wagner, P. D. (1998). Lactate efflux from exercising human skeletal muscle: role of intracellular. Journal of Applied Physiology, 85(2), 627-634.
arm pump, cycling, lactate, lactic acid, moto, motocross, mountain biking, supercross. Bookmark. What occurs is individuals wind up doing excessive cardio exercise and barely any resistance workouts. rate has slowed down because they’ve misplaced muscle mass.